GOLD PRICES recovered a $5 drop in London trade Thursday as the US Dollar paused from this week's gains on the currency market following a surprise rise in the number of Americans filing for jobless benefit claims. The Euro gold price in contrast held firm near the highest since April 2017 at €1155 per ounce as France recalled its ambassador to Rome over what Paris called " outrageous statements" from Italy's economic development minister Luigi Di Maio, "exploiting relations for electoral purposes." Despite the UK's ongoing Brexit impasse, London's stock market lost the least among European equities, slipping 0.4% as Germany's Dax in Frankfurt lost 1.8% for the day. Leader of Italy's self-declared 'anti-establishment' M5S party – now in coalition with the right-wing Lega – "The winds of change have crossed the Alps," tweeted Di Maio after meeting self-appointed leaders of the gilets jaunes protests, which have repeatedly demanded that France's President Emmanuel Macron resign, now planning to stand in May's European elections. Priced in the Dollar, gold prices had briefly dipped below $1303 per ounce for the first time in a week in Asian trade, where financial markets in China – the world's No.1 gold consumer market – remain shut for the Lunar New Year until Monday. "Global slowdown concerns saw the Dollar gaining and gold moving down," Reuters quotes one spread-betting analyst. 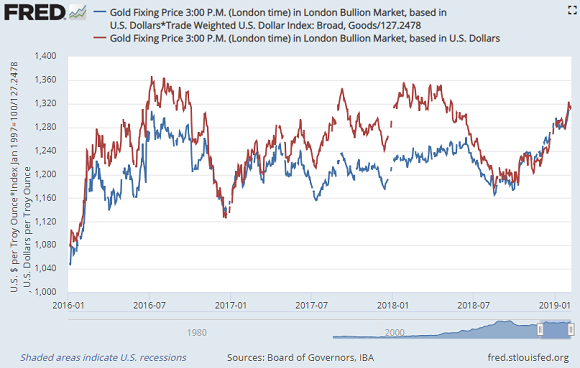 But while gold prices are "pressured by a stronger Dollar," says the Wall Street Journal, they "remain near their highest levels since June" in USD terms. The Reserve Bank of Australia yesterday held its key interest rate at a record low of 1.5% and warned that GDP growth looks "weaker than expected...due to slow growth in household consumption and income." UK Prime Minister Theresa May meantime had " robust but constructive" talks on Brexit – set to take effect on 29 March – with European Commission President Jean-Claude Juncker in Brussels today. Further talks are now due for end-February, while UK and European Union negotiators seek "a way through" on the Irish backstop.